This article explains the arm movements used in the front crawl / freestyle stroke. In fact, the arm stroke accounts for as much as 90% of the propulsion in the front crawl, while the flutter kick only accounts for 10%. So using the proper swimming technique is essential. One can see that in the front crawl, the arms execute alternating movements. While one arm pushes water backward underwater, the other arm recovers forward above water. To start our discussion, we imagine that one of the arms is extended forward underwater at the end of its recovery. The other arm has begun its propulsive phase. The wrist flexes slightly to start the downsweep. The elbow bends but is kept high in the water. As a result, the forearm moves downward and backward until the underside of the forearm and the palm are facing back. The upper arm moves a little bit outward so that it is easier to keep the elbow high in the water. The body rolls towards the side of the arm that sweeps down. The downsweep should happen quickly. However, no excessive amount of force must be applied to the arm during this phase, as this will only push water down, wasting energy and creating drag. At the end of the downsweep, the shoulder, elbow, and hand are positioned on the same vertical plane. The shoulder is at the top while the hand is at the bottom, between 20 and 28 inches (50 – 70 cm) deep. The elbow is bent about 90° and will keep this angle during the subsequent propulsive phases of the arm stroke. The underside of the arm and the palm are now facing backward and slightly outward. This is the so-called high elbow catch. The insweep is the first propulsive phase of the arm stroke. Once the arm is in position at the catch, the upper arm is adducted (moved in) toward the rib cage while the elbow keeps its angle and no rotation occurs in the forearm. The whole arm is in fact used as a big paddle. Keeping a high elbow during the catch and insweep phases improves propulsion. As a consequence, the forearm and palm move inward, upward and backward only due to the adduction of the upper arm. The insweep ends once the hand arrives under the midline of the body. This is the second and most propulsive phase of the arm stroke where the direction of the arm movement changes. At the start of the upsweep, rotation occurs in the forearm so that the underside of the forearm and the palm are now facing backward, upward and outward. The hand then moves backward, upward and outward from below the chest toward the hip. The elbow is still bent so that the palm and forearm can be kept facing backward for as long as possible. The body rolls toward the stroking arm. At the end of the upsweep, no force should be applied because the forearm and hand are mostly moving upward. Otherwise, water would be pushed upward, increasing drag and pushing the hips down. The shoulder, upper arm and elbow exit the water in that order, followed by the forearm and hand with the palm turned inward to minimize drag. After this, the arm is brought forward above water, leading with the elbow and with the lower arm relaxed and dangling. The recovery should be compact, meaning that the hand hovers above the water and swipes close past the rib cage. While the arm should be relaxed during the recovery, the momentum built up during the upsweep should be used to recover the arm forward quickly. Once the hand has passed the head, it enters the water with the fingertips first. The rest of the arm moves through the hole opened by the hand in the water and continues to move forward underwater until it is fully extended. The arm stroke cycle can then start anew. Ideally, during the entry, the forearm is neither rotated outwards nor inwards but in a neutral position. This creates less tension in the shoulder and means that all fingers except the thumb enter the water at about the same time. The timing between both arms is very precise: while one arm enters the water in front of the head before extending forward underwater, the other arm starts its propulsive phase with the insweep. The timing between arm stroke and leg kick is also very precise. Whether you use a two beat kick or a six-beat kick, the downsweep of the propulsive arm and the downbeat of the leg on the same side always starts simultaneously. 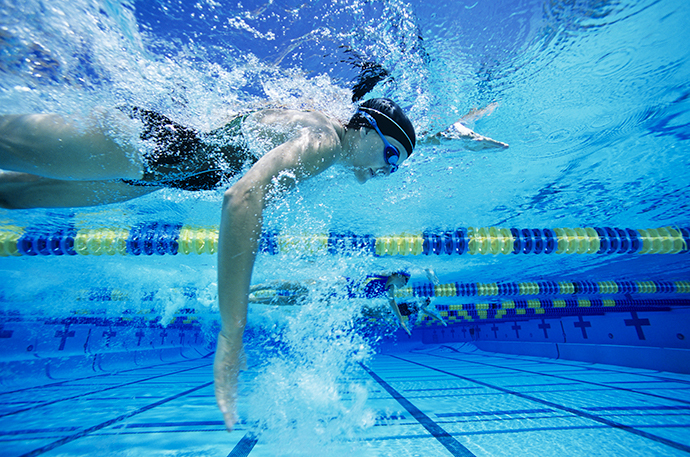 This wraps up our discussion of how to swim front crawl with correct arm stroke movements. The advanced swimming technique section covers common front crawl mistakes to avoid. Is this statement in “Swim Stroke Phases” section correct? Synchronization between arms and legs. Whether you use a two-beat kick or a six-beat kick, the downsweep of the propulsive arm and the downbeat of the leg on the same side always starts simultaneously. This is a great job, and useful. Thanks so much.